Mori Ponsowy was born in 1967 in Buenos Aires (Argentina) but grew up in Perú and Venezuela. She graduated with honors in Philosophy, then earned a M.A. in Political Sciences (Universidad Simón Bolívar, Venezuela) and an M.F.A. in Creative Writing at Emerson College (Boston). 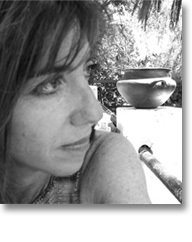 Her poetry collection Enemigos afuera (2001) won the Primer Premio Nacional Iniciación de la Secretaría de Cultura de la Nación, and her novel Los colores de Inmaculada (2006) won the Premio de Novela de la Diputación de Cáceres. She has translated two books from American poets: The Father by Sharon Olds (El padre, Bartleby, España) and What The Living Do by Marie Howe (Lo que hacen los vivos, Luna Nueva, Venezuela). She is now back in Buenos Aires, where she works as a journalist and translator.